The baby octopus on the edge of my plate matched the size of my fist. Its skin, charred in spots, glistened with cooking oil. "Start with la cabeza, the head," instructed our server. Unsuccessfully, I searched for the octopus's eyes while taking a gulp of my pisco sour. Deflated egg-white foam lodged into the edges of my lips. It was a waste, I decided as my teeth broke down the second half of the baby octopus's head. An entire intelligent life sacrificed for what? A less-than-enjoyable eating experience. A hundred or so calories of energy. Decapitated, the body of the octopus on my plate was now a ring of curled arms, frozen in position by flames that danced through the grates of a grill. The chef had overcooked the tentacles and they were rubbery, smooth to the tongue on one side, embossed with miniscule suckers on the other. The whole octopus was now inside me. It's not often that you consume a creature in its entirety. My last time had been a fried cricket at a taco festival, which took longer than I would have liked to chew. I pictured the bites of baby octopus reassembling within my body until the revived cephalopod puffed its tentacles, bouncing off the walls of my stomach. When the flutters inside me turn to more powerful kicks, I guide my husband's hand to my stomach. Somehow, I feel that if I only tell him about our baby's movements, they won't be real to him. A father can never sense an unborn child as viscerally as a mother, but I want to help him connect as much as possible. I push his palm into me below my rib cage. There's a strange validation that comes from someone else bearing witness to the surreal experience of being a vessel for another living thing. "That's its head," my husband announces, and I wonder what that head will think and feel 5, 10, 20 years from now. What would a mother octopus think if she knew where her baby would end up? Is a North Pacific giant octopus smart enough to behold the horror of her offspring journeying from sea to boat to market to grill to plate to the stomach of a foreign species? Maybe, but an octopus would not be alive to consider the fate of its spawn. The North Pacific giant octopus is semelparous, which means its life holds only one reproductive event, followed soon after by death. After secreting an alluring mix of chemicals, a female entices a male to mate with her. Usually solitary creatures, the octopuses must find this sudden closeness novel and strange. The male's hectocotylus, an arm charged with transferring sperm to a mate, begins to inflate. It takes an hour for him to reach inside her mantle and slip her the payload: a three-foot long package of some seven billion sperm. 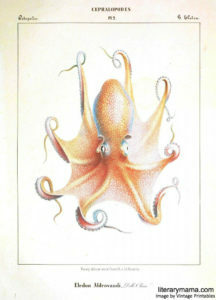 After his hectocotylus retreats, the male octopus drifts into senescence. He ceases hunting and wanders the ocean aimlessly. Starving, he begins to shrink and white lesions bloom across his skin. As his progeny begin their journeys in other parts of the ocean, his mind slumps. In this state of dementia, he will die from hunger if he doesn't become prey to a great white first. For humans, reproducing is supposed to signal the beginning of a new chapter—not death. I imagine congratulating an octopus on his imminent fatherhood. "You're going to be a dad!" I'd say, shaking his tentacle enthusiastically. "How does it feel?" I turn the question on my husband and myself. Reproduction means a goodbye to carefree mornings and spontaneous nights. It means we will do the things we love separately for a while, taking turns skiing until our child is old enough for ski boots. We will put someone else before ourselves and before the collective us for the foreseeable future. This different existence is not a death sentence, but it is a watershed moment for our lifestyles and identities. Egg-tending, however, doesn't require a fully functioning brain. Like the male, the octopus mother is also beginning to lose her wits and forego sustenance. At least she has a task to keep her going. She dotes on her thousands of eggs, preventing bacteria and fungi from collecting on them. This sense of simple purpose—egg tending—must be complementary to her encroaching intellectual deterioration. A sharper female might grow impatient with such a prescribed daily routine. She might throw up her tentacles in frustration and swim off, abandoning her brood. It almost makes sense that the tedium of octopus motherhood is accompanied by a dulling of the mind. Six to eight months after the octopus has laid her eggs, they hatch. The octopus mother blows them out of her den and they float to the sea's surface, where most will meet early ends. I picture the demented octopus mother in her final act: ousting thousands of babies from her home. Having gained a continuation of her genetic code and lost most of what she once was, she dies, a physical and mental shell of her former self. Some of us human mothers are lucky by comparison, with the world telling us we can have both the satisfaction of our reproductive potential and another type of fulfillment. One that we might get from work, hobbies, love, or traveling to Peru to eat baby octopuses. While I'm grateful for this categorical freedom, it also smacks of illusion. Will I really be able to have it all? Or is this blessing a curse in disguise? As a woman, I feel as if I'm expected to overextend myself until I can't do even one thing well. Society believes that we can have professional achievements and be good mothers, but surely there must be a catch. Will that catch be a crushing disappointment stemming from expectations set unrealistically high? People have told me what I stand to gain and lose in becoming a mother. The casualties of motherhood include independence. Some of my intellect, like an octopus—baby brain, they call it. A part of myself, they say, because I'll never be the same. And along with a baby, I'll get long days and years that blink by. A life purpose of unprecedented scale. And a biological love that blooms on cue when the thing that's been kicking inside of me comes out. I'm acutely aware that this maternal attachment is driven by hormones, but this awareness, to my surprise, doesn't dull the feeling. Perhaps I'm experiencing some of the same hormones that cause an octopus mother to relinquish her own life for her offspring. This last change, this neurological force of love, is the one I was entirely unprepared for: the reminder that we humans are animals, too. Maya Silver writes about the environment, food, and recreation, among other topics for publications including NPR, Earth Island Journal, and many others. She is currently working on a nonfiction book about people displaced by climate change. She lives in Kamas, Utah with her husband, four-month-old daughter, and dog. The tentacles of emotion have reached deep inside of me with this piece. I hope you are immersed in the wonder of Jolene, and all are doing swimmingly.